Here are reviews of two charming children’s picture books published by Raising Literacy Australia (RLA.) RLA/The Little Big Book Club has a great website, that offers lots of support activities for hundreds of books. There are many, many free resources, and you can also search to see if there are activities to support the book you want. Below my reviews, you'll find more information about RLA, and the important work it does. A perfect board book for families to share with their little ones. Board books are very important. These are often the first books a child encounters, and must be made to withstand lots of reading, being used as a toy, and even being chewed! Savvy authors and illustrators keep their stories simple, and their illustrations uncomplicated for our very young “readers”. 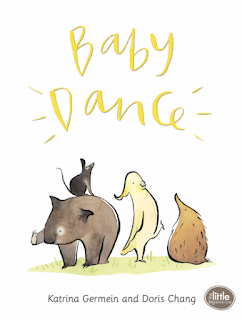 In Baby Dance, Germein’s simple rhyming text is perfectly complemented by Chang’s delightful sketches of 4 baby Australian animals: an echidna, a bandicoot, a wombat and a cockatoo. Even with such a simple board book, there’s humour in the subtext - when we come to the line “Baby sings” we see cockatoo “singing” while wombat covers his ears. I love that Germein’s text is rhythmic and rhyming, but also chooses action words that human babies will proudly have in their own repertoires. Highly recommended for families and new parents! Finally, the day has arrived! Four beautiful eggs hatch and four delightfully fluffy chickens emerge. One little chicken quickly realises she’s different, but not sure why. In a quest to find answers and hopefully a friend, she sets off to explore the farm. 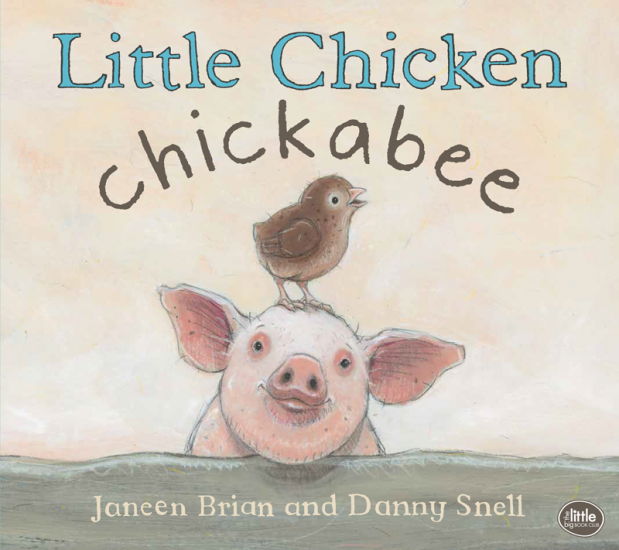 Danny Snell’s illustrations are superb… with the use of acrylic paint, pencil and collage on card he has endearingly and perfectly captured the farm yard scenery, the animals and all of Little Chicken Chickabee’s conflicting emotions. An outstanding picture book of the highest quality which focuses on differences, perseverance, problem solving and ultimately friendship. There’s something very heartstring-tugging about this book! I loved the simple tale of a little chicken who marches to the beat of a different drum, and meets a kindred spirit in Pig. As an author, Brian has often gifted us with a nudge toward the sheer fun of language, and this children’s picture book is no different. Snell’s artwork is full of character and whimsy. This makes an excellent read-aloud to share with kids under 5. There are activities that parents, educators and carers can use with kids and Little Chicken Chickabee suggested on the website. Raising Literacy Australia (RLA) is a not-for-profit organisation with a vision to enrich Australia lives through literacy. Our two key programs are The Big Book Club (for adult readers) and The Little Big Book Club (supporting children aged 0-5 years). Our goal is to support all individuals in their pathway to social inclusion and lifelong learning and we do this through advocacy, programs, partnerships and by sharing knowledge. The organisation is based in South Australia and receives state government funding which enables us to distribute 21,000 Baby, 21,000 Toddler and 21,000 Preschool Reading Packs yearly to families, for free. The initiative has been successfully running for over 11 years, and longitudinal research from the University of South Australia has shown that on receiving a pack for their child, parents read 70% more often with their children. RLA also operates a publishing house to underpin its core programs and activities. We work with local and national authors and illustrators to commission original picture and board books for young children which are included in the SA Reading Pack project and also made available for sale to other NFP’s, libraries, national literacy initiatives and the general public via our website. Over 15 quality titles have been produced since 2006, including the recent publications of Little Chicken, Chickabee, Baby Dance and Fancy Pants. A further 5 titles will be published in 2017. One final, but important component of RLA is the Building Foundations for Early Learning (BFEL) program – it is a training package for anyone that cares and supports young children from birth to five years (e.g. child care workers, librarians, family day care, outreach services). The early years of a child’s life is where parents and carers can have a profound and long-lasting impact on the child’s learning ability. The BFEL training provides foundational knowledge about brain development, literacy and best practice . BFEL is a key part of our holistic approach to educating the community about the importance of the first five years and how practitioners can best support the learning potential of children accessing their services.